By pure accident, I have now seen several of the most famous, most beautiful tapestries in the world. Is it any wonder that France created and houses so many of these treasures? It seems like a fancy tapestry kind of place. Or, more accurately, places: several of the great houses for manufacturing tapestries in history were Aubusson, Beauvais (where you can still have tapestries made today), and the most famous of all, right around the corner from me in Paris, Manufacture des Gobelins. Why Les Gobelins? Simple, one of the most important resources was nearby: the factory for dying yarns and the secret for the most beautiful, long-lasting, brilliant scarlet colors. 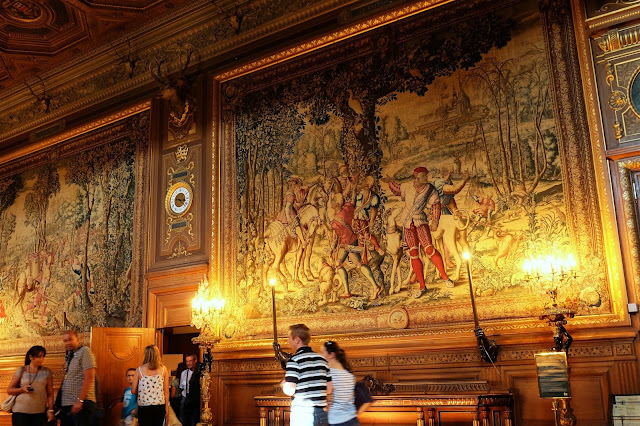 Here (and above) at Chantilly castle, the tapestries -- created at the Manufacture des Gobelins -- depict many common themes: the hunt, a battle scene, mythology. These are not particularly famous tapestries but are very representative of the great tapestries that came out of Les Gobelins during its heydey in the 17th century. You may not be surprised to hear that it was during Louis XIV's reign (it seems everything was...). The chief designer for much of the time was Charles LeBrun, who is seemingly credited with an impossible number of works. But for some of the most famous, and greatest tapestries that still exist (it's estimated up to 70% of France's tapestries were destroyed during the French Revolution and beyond, either burned or cut up and used as fabric), you need to head to Angers, to visit the gorgeous castle there, where you can see the delightfully-dramatically named Tapestry of the Apocalypse. It's based on the Book of Relevation and is, of course, about the apocalypse, hell-fire, the four horsemen, pitchforks, forked-tongue dragons, the works. I'm telling you, I wouldn't be surprised to see Trump's face in it. Sure, that's a snarky comment, but it's not such a far stretch to link this with politics: in fact, it was originally woven as a political statement as well as religious piece of art. It was woven at the height of the Hundred Years' War (the mid 14th-mid 15th century conflict between France and England) and is a reference to the ongoing battles and privations of living in a perpetual state of war. 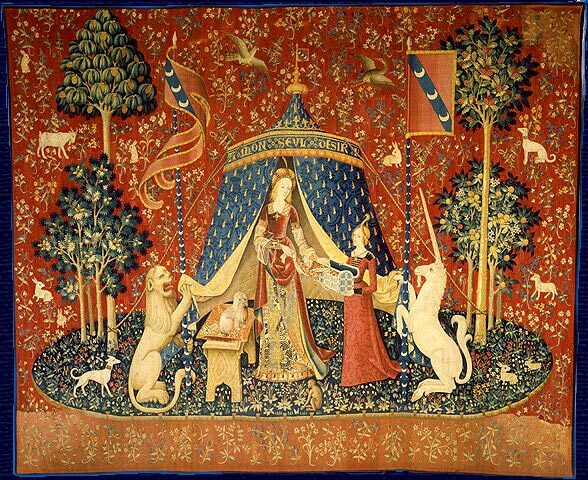 The fact that it was created between 1377-1382 makes this series of tapestries the oldest existing tapestry (actual woven tapestry, more on that later) in France. Closer to home (well, closer to my home), you can see the Lady and the Unicorn ("Dame à la licorne") at the Musee de Cluny, in the 5th arrondissement of Paris, where I live. It's actually a series of six tapestries (so six ladies, with lots of unicorns), and they were woven in the late 15th/ early 16th century. The six tableaux, which cover the five senses plus desire, were lost for centuries but are not likely to get lost again, as they're now the stars of the medieval museum. And with good reason: They're beautiful tapestries, in the millefleur (thousand-flower) style, saturated with rich color, references to nature, and the fantasy world of unicorns. It's not only considered one of the most beautiful tapestries ever created and still in existence, it's often called one of the most beautiful medieval works of art of any kind. It may be slightly cheating to call this a French work, in that it seems to have been woven in Flanders (now Belgium). But it was made from designs drawn in Paris, and it's displayed in the 5th arrondissement, and you can't get much more French than that. But without a doubt, the most famous tapestry in the world is the Tapestry of Bayeux. The crewel irony (yes, the spelling is on purpose) is that the most famous tapestry in the world is ....not a tapestry. It's crewel work, which is to say woolen yarn embroidered onto a linen background. Still, it's called a tapestry, and I have seen it in person, so I'm including it. It's also one of the biggest tapestries -- at 70m long and half a meter high, and perhaps the oldest-known existing tapestry in that it was created in the 1070s (though since it is not really a tapestry, the Tapestry of the Apocalypse still wins that title). That's nearly a thousand years ago, and it's still hanging on a wall. Incredible. 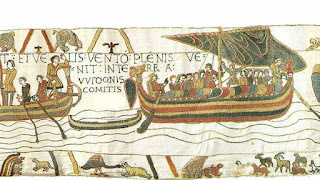 It was commissioned by French Bishop Odo, the half brother of William the Conqueror (Guillaume le Conquerant, Duke of Normandy) to recount the story of William's 1066 Battle of Hastings and conquest of England, that little back-water island. 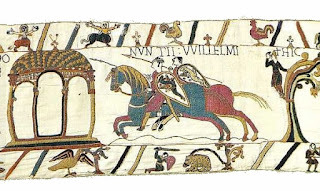 It was actually stitched in England, but immediately came back to France, where it was displayed on occasion at the Bayeux Cathedral, wrapped up and down the interior walls to tell the story to a largely illiterate medieval crowd. Now, there's a museum dedicated solely to the tapestry and its story. The ecoustiguide hurries listeners past it at such a frenetic pace (probably because there are always a lot of people to shuffle through) that by the time we get to the end we are slightly breathless and giggling. But don't let that take away from how impressive it is that a thousand year old embroidery is still in such great shape, as well as how impressive the whole 1066 story is. Le Petit Saint Roch is a raw sheeps' milk cheese from Corsica, with the milk pressed but not cooked, and aged at least 4 weeks. I say "at least" because while my specimen is a beautiful silvery-white, I've seen others that are closer to rusty-orange with streaks of brown. Those would be on the older side, of course. As it is, I'm quite happy with my slightly younger, probably-slightly-less-funky specimen and find it to still have character (but not too much) and stink (but not too much). It looks like it would be a creamy, spreadable cheese, but in fact it's more a semi-hard, sliceable cheese with a chewy -- yet still silky -- interior. It's a convoluted connection, with many threads that need to be woven together. You see what I did there. Threads are really the operative word. Saint Roch was a 14th century saint and -- new word for me coming up in both French and English -- a thaumaturge, which is apparently a magician, a worker of wonders and miracles. Saint Roch is the patron saint of many organizations and brotherhoods, including surgeons, dermatologists, apothocaries, street pavers, furriers, used-clothing and furniture buyers and sellers, animals (often of groups like the SPCA), and carders. It's the carders that I'm focusing on here as their job in medieval times was to card, i.e. comb, the wool and clean it to prepare it to be spun into threads. From there, there are many steps that also need their saintly protection: spinning into threads (Saint Nicholas of Myra), dying the threads (Saint Helena), designing the pattern (Saint Benedict Biscop), setting up the loom (Saint Gummarus), and working the warp and weft (Saint Anthony Mary Claret). While we're on the topic, St. Uguzon is one of the patron saints of cheesemakers (and, perhaps by extension cheese bloggers? ), and was, in his lifetime, a shepherd, which makes it particularly appropriate for him to protect the maker of Le Petit Saint Roch.